Powers/Abilities: A highly skilled assassin, the acrobatic Dare was trained at first by her failed fighter father and later by the elderly woman known as Winterstick to outfight men twice her size and think her way around the smaller ones. She is proficient in the use of many weapons, but is especially deadly when armed with her sword. While undergoing an involuntary "government experiment," Dare was exposed to radioactive chemicals that left her totally blind. But the chemicals also left Dare with enhanced strength and heightened reflexes while boosting her remaining four senses to superhuman levels. With "hypersenses" of touch, smell, hearing, and taste, almost nothing escapes Dare's perception. She has also developed an "internal radar" ability to sense the proximity and arrangement of objects as a result of the mutagenic effects of her exposure to the same radiation that heightened her senses. (Dare the Terminator#1) - Slade Murdock left the world of high-powered international law when the rules would not allow justice. Trained at first by her failed fighter father and later by the elderly woman known as Winterstick, she learned to outfight men twice her size and think her way around the smaller ones. Taking the name Dare, she became an assassin operating out of New Gotham. (Assassins#1 (fb)) - Dare was captured by corrupt New Gotham mayor / crimelord the Big Question (E. Nigma Fisk) who subjected her to a "government" experiment. Calling her a "daredevil," the Big Question had his surgeons implant two horns on Dare's head so that she could look more like a true daredevil. The radioactive chemicals used in the experiment caused Dare to permanently loose her eyesight. (Dare the Terminator#7) - Dare battled her old nemesis the Big Question in the villain's first on-panel appearance. (Dare the Terminator#131) - Dare battled the expert marksman / assassin known as Deadeye (Bill Lawton) in the villain's first appearance. (Mutant Titans#83) - Dare was forced to kill her daughter Jericha during the finale of the "MUTANT HUNT" storyline. (The Nightmarish Dare#13) - In another altercation with Dare, Deadeye severely damaged her right eye (resulting in her having to wear a patch) -- although Dare had already lost her sight in an experiment involving radioactive chemicals before this incident. (Dare the Terminator#168) - When Tombstone the Ravager found that having two new mercenaries in town was too much trouble, he thought he had found a unique way to take care of this nuisance: hire Dare to kill rival assassin Catsai (Elektra Kyle) and hire Catsai to kill Dare. Then, with the survivor wounded, his personal guards could complete the job. But instead of hurling taunts upon their first meeting, the two female assassins shared information and took the job back to their mutual employer, deciding to kill their client instead -- the start of a long and beautiful friendship. (Dare the Terminator#181) - Dare was unable to help when Catsai was "killed" by rival assassin Deadeye after a climactic battle. But Catsai, who proved to have as many lives as her namesake, returned to the world of the living soon after. (Secret Crisis of the Infinity Hour#7) - Both Dare and her partner Catsai were transported to Apokolips by Dr. Strangefate (Charles Xavier) to assist in preventing the evil Thanoseid's plan to warp reality by using the Infinity Links. Both assassins were present when American Girl (Carol Barnes), the former sidekick of Super-Soldier (Clark Kent), heroically sacrificed her life to further the heroes' cause. (Dare the Terminator#232) - Dare battled the steroid-enhanced terrorist known as Nuke (Bane Simpson) in the villain's first on-panel appearance (although Nuke presumably operated behind the scenes with Deadeye in THE NIGHTMARISH DARE #13 -- see Comments). (Assassins#1 (bts)) - Facing mounting rumors that he was under the influence of the mysterious mystic known as Doctor Strangefate (who also resided within New Gotham's Arkham Tower), the Big Question devised a brilliant plan to rid himself of Dare and Catsai while at the same time save his tarnished reputation. Keeping his identity a secret, he hired Dare and Catsai to come to Arkham Tower and assassinate the Big Question. He would then have Dare and Catsai killed and claim that Dr. Strangefate enchanted them to murder the Big Question. By butchering Dare and Catsai, the Big Question would thus cause his reputation to be reborn and prove to New Gotham's public that he was New Gotham's true power. And even if Dare and Catsai did manage to kill him, then at least the Big Question would be killed in a fight and not as some magician's stooge. To make things more interesting, the Big Question then hired three of New Gotham's top mercenaries, Deadeye (Bill Lawton), Lethal (Sergei Minerva), and Wired (Nathan Chase), and instructed them to kill Dare and Catsai when they came to Arkham Tower to make their hit. Dare then stood guard as Catsai attempted to pry the elevator doors open with one of her sais. But as Dare used her hypersenses to "read" the surroundings, she heard the faint grunt of high-pitched breath in the elevator shaft and smelled the chemical stink of heavy explosives -- sure signs that the elevator was rigged to explode. Dare pulled Catsai away to safety just as a violent explosion engulfed the elevator doors. When the smoke cleared, the feral assassin known as Lethal was ready to pounce on his prey. Dare avoided Lethal's initial attack by using her "internal radar" sense to track and catch his throwing blades in midair. Catsai's pet cats then tripped Lethal, but he soon recovered and began to open fire on Catsai. Catsai gracefully dodged the barrage of bullets and used her blade-tipped whip to ensnare Lethal while Dare delivered the deathstroke with her sword. The female assassins then left Lethal for dead and proceeded to climb up the elevator shaft. Dare and Catsai were next blindsided by Wired, yet another mercenary hired by the Big Question. Wired cut the cables on which Dare and Catsai were climbing, sending the pair of assassins into a freefall. But an angry Catsai recovered from the fall and sent Wired crashing through a metal door, impaling the mercenary on his own weapon and leaving him for dead. Dare ad Catsai finally reached the 107th floor where they were confronted by the jovial Big Question, who revealed to them that it was he who hired them to kill him. The Big Question spelled out his grand scheme: he would kill Dare and Catsai and claim to New Gotham's public that Doctor Strangefate enchanted the assassins to murder their beloved mayor. By butchering Dare and Catsai, his reputation would be reborn. An enraged Dare leapt forward with her sword drawn. But it was another trap -- a metal door slammed shut between Dare and Catsai, leaving Dare and the Big Question alone in one-one-one combat. 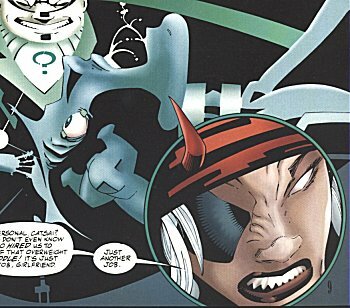 The Big Question blocked all of Dare's attacks and then ripped the surgically-implanted horns from her head, leaving the female assassin for dead. Luckily, Catsai was able to prevent the Big Question's master plan from coming to fruition. (Assassins#2) - "Blood is Thicker!" - The fate of Dare was revealed as Catsai received a visit from Dr. Strangefate (Charles Xavier). Dare (Slade Murdock) debuted in the premiere issue of her own title, DARE THE TERMINATOR. The early issues of the series, which were written by talented writers such as Frank O'Neil and J.M. Wolfman and edited by "Smilin'" Stan Schwartz, became instant Amalgam Comics classics. Fellow assassin Catsai (Elektra Kyle) was introduced into the series in DARE THE TERMINATOR# 168 and caused a tremendous sales surge for Dare's title, especially the storyline wherein Catsai "died" after a climactic battle with Deadeye (Bill Lawton) -- DARE THE TERMINATOR#181 (April, 1982). CATSAI eventually spun-off into her own limited series, penciled by Jim Balent, who unwittingly created a controversy among Catsai fans by drawing her ears too big. But Catsai continued to appear regularly in the pages of DARE THE TERMINATOR as well and later issues of the series were created by the popular creative team of writer Dan Chichester, penciler Scott McDaniel, inker Derek Fisher, colorist Pat Garrahy, and editor Kevin Berganza -- the team responsible for the epic "Cat Up a Tree" storyline. 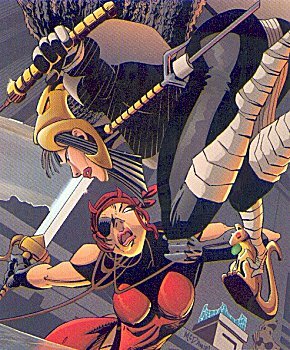 So when Amalgam Comics fans clamored for a new monthly series featuring both Dare and Catsai, Chichester and company were hand-picked to develop the new adventures of the Amalgam's Lethal Ladies in ASSASSINS. DARE THE TERMINATOR is an amalgam of Marvel's DAREDEVIL (Marvel's Daredevil debuted in DAREDEVIL (vol. I)#1) and DC's DEATHSTROKE THE TERMINATOR. Frank O'Neil is an amalgam of Frank Miller (writer of Marvel's DAREDEVIL) and Dennis O'Neil (writer of DC's AZRAEL, BATMAN, and DETECTIVE COMICS). J.M. Wolfman is an amalgam of J.M. DeMatteis (writer of Marvel's DAREDEVIL) and Marv Wolfman (writer of DC's DEATHSTROKE THE TERMINATOR and THE NEW TITANS). "Smilin'" Stan Schwartz is an amalgam of Stan Lee (editor of various Marvel Comics titles) and Julius Schwartz (editor of various DC Comics titles). Jim Balent is an Amalgam Universe version of Jim Balent (artist of DC's CATWOMAN). Dan Chichester is an Amalgam Universe version of Dan Chichester (writer of Marvel's DAREDEVIL). Scott McDaniel is an Amalgam Universe version of Scott McDaniel (penciler of Marvel's DAREDEVIL and DC's BATMAN and DETECTIVE COMICS). Derek Fisher is an Amalgam Universe version of Derek Fisher (inker of Marvel's GREEN GOBLIN). Pat Garrahy is an Amalgam Universe version of Pat Garrahy (assistant editor of Marvel's DAREDEVIL and colorist of DC's BATMAN). Kevin Berganza is an amalgam of Kevin Dooley (editor of DC Comics) and Eddie Berganza (editor of DC Comics). Special thanks to penciler Matthew Haley for identifying Dare (Slade Murdock) as one of the characters present at the death of American Girl (Carol Barnes) in SECRET CRISIS OF THE INFINITY HOUR #7. 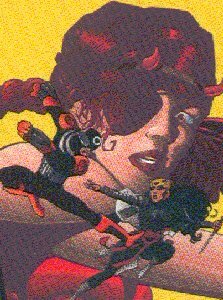 Jericha was one of Dare's (Slade Murdock) two metamutant daughters and the sister of Terra-X. Presumably, she was also a member of the team known as the Mutant Titans. Unfortunately, Dare was forced to kill Jericha in MUTANT TITANS#83 during the finale of the "MUTANT HUNT" storyline. Jericha is an amalgam of Karma (Xi'an (Shan) Coy Manh) of the Marvel Universe and Jericho (Joe Wilson) of the DC Universe. Tombstone the Ravager was a New Gotham underworld figure. When he found that having both Dare (Slade Murdock) and Catsai (Elektra Kyle) in town as assassins was too much trouble, he though he had found a unique way to take care of this nuisance: hire each to kill the other. Then, with the survivor wounded, Tombstone the Ravager's personal guards could complete the job. But rather than attempt to kill each other, the two female assassins shared information and decided to kill Tombstone the Ravager instead. Tombstone the Ravager is an amalgam of Tombstone (Lonnie Thompson Lincoln) of the Marvel Universe and Ravager (Bill Walsh) of the DC Universe. Winterstick is the elderly woman who taught Dare (Slade Murdock) how to be an assassin, although she was not doing well in the final issues of DARE THE TERMINATOR. 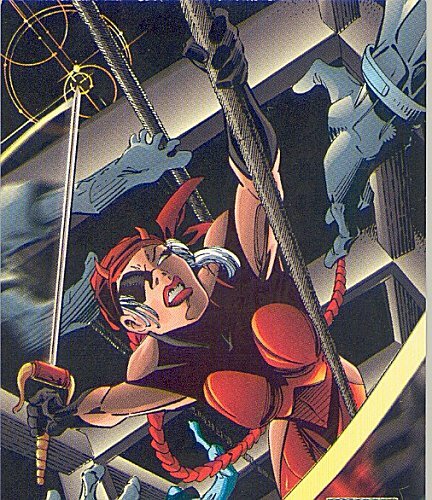 Winterstick is an amalgam of Stick (Daredevil's trainer) of the Marvel Universe and Wintergreen (Deathstroke's confidant) of the DC Universe.